The Battle of the River Plate was the first Naval battle of World War two and took place on the 13th of December 1939. Between the British/New Zealand Navy and the German Navy. 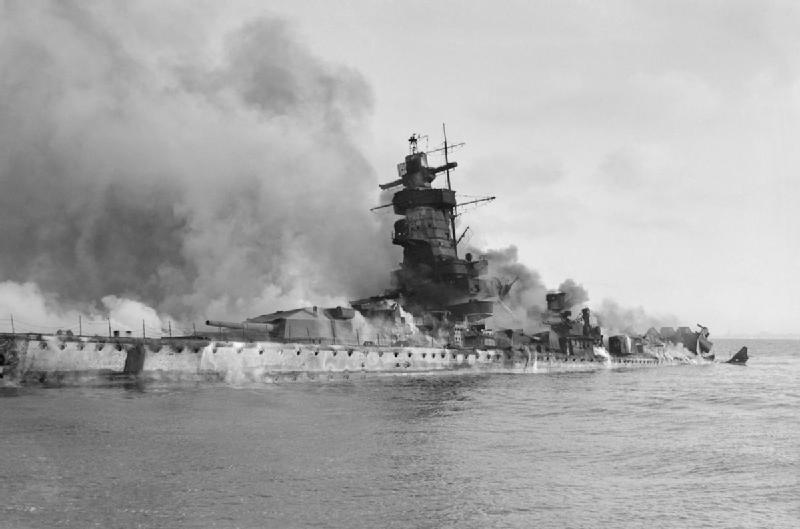 WWII in South America: Graf Spee in Flames. Photo credit: Imperial War Museums UK. The German Battleship, the Graf Spee was known to be in the waters surrounding South America in the lead up to the declaration of war in September 1939. At the start of the war, Force G, the British South American Cruiser squadron was sent to look for her. The squadron consisted of three ships – the Heavy Cruiser HMS Exeter and the two light cruisers Achilles and the Ajax. The Achilles belonged to the Royal New Zealand Navy. In the nights leading up to the 13th of December the battleship was spotted using its spotlights and British Admiralty was told by a Norwegian freighter that she was headed towards to South America. The Admiralty believed the Graf Spee would target the merchant vessels operating in the River Plate Estuary between Uruguay and Argentina. On the 12th of December the three ships rendezvoused off the coast and began to conduct manoeuvres. The policy of Commander Henry Harwood was to attack with all three ships at once, in two units. The Exeter to one flank and the two light cruisers to the other. The intention of the Commander was to split the superior firepower and range of the Graf Spee and hope to inflict some damage. At 05:20am on the morning of the 13th smoke was spotted on the horizon around 390 nautical miles east of Montevideo. The British ship, using their speed advantage engaged the Graf Spee. The battle on and off over the next 24 hours, with some damage being done to both sides. The Graf Spee had some critical damage to her fuel systems and as such headed towards Montevideo at full speed for urgent repairs. What happened next was a mix of propaganda and political manoeuvring. Although Uruguay was officially a neutral country in the war, she had a very strong pro British stance due to the influence of the British and trading with the nearby Falkland Islands. 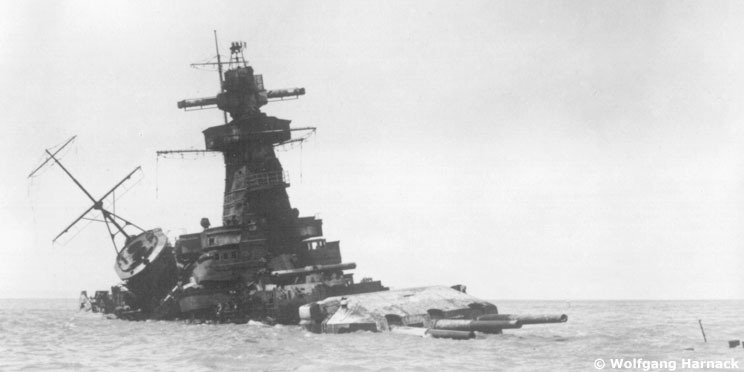 The Graf Spee was allowed 72 hours to conduct repairs before having to leave the port. The Germans feared that a larger force was being assembled in the River Plate awaiting the return of the Graff Spee including the British aircraft carrier, the Ark Royal. British diplomats in Montevideo certainly add fuel to this fire, and crew members returning to the ship notified their captain. The captain, Hans Langsdorff decided the best thing to save an embarrassing defeat was to scuttle the ship upon leaving the port. The Graff Spee had only around a third of her ammunition left, and even if she won the improbable battle, she would then come into a lot more difficulty further north and reaching Germany would be nigh on impossible. Upon scuttling the ship over 1000 crew were taken to camps in Argentina. Many of these crew members ended up settling in Argentina and Uruguay and lived there for the duration of the war and beyond. There are some stories about crew members continuing to fight in Argentina during the war, but very little evidence. Adolf Hitler was said to be infuriated by the scuttling, and Langsdorff shot himself in Buenos Aires, Argentina on the 19th of December 1939. There are some plans to raise the wreck from the bottom of the estuary, and discussions continue. Did you enjoy this blog? Here are some other quirky blog you may also be interested to read: Nazis in Antarctica, German settlements in Peru and Inca Kola… The Golden Kola made by an Englishman! Want to visit the area of the River Plate? Then give us a call! We specialize in trips to South America and can tailor a tour to suit your specific interests.